Though Activision and Radical Entertainment’s PROTOTYPE 2 isn’t destined to grace consoles until April of next year, the marketing promotions for the game have already begun. 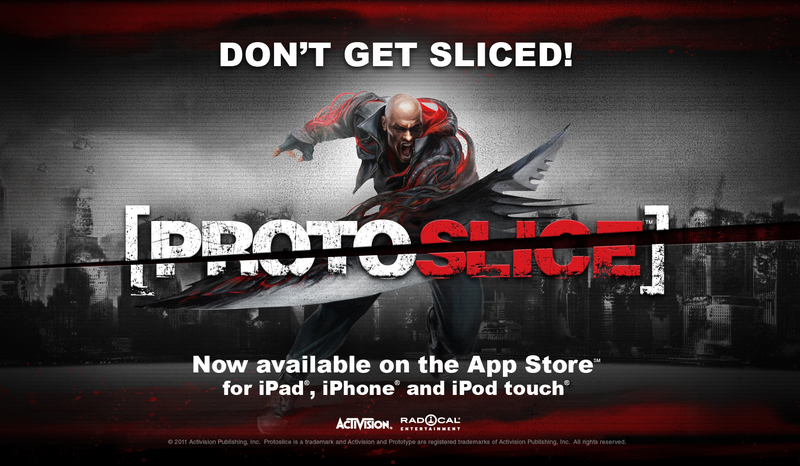 Today, Radical Entertainment, in collaboration with Slice / Slice HD creator TwitchGames have launched PROTOSLICE™ and PROTOSLICE™ HD, which are free PROTOTYPE 2-themed versions of the popular Slice iOS titles. PROTOTYPE fans can now see just how sharp Sgt. James Heller’s Blade Arm really is. PROTOSLICE™ utilizes Sgt. James Heller’s deadly Blade Arm to bring this “visceral scare puzzler” to life as players work carefully clear away the layers of very sharp Prototype-blades in order to push the P2 button(s) without getting their fingers sliced! If sliced, you’ll ‘bleed’ onto the glass and the puzzle will reset. Each blade can only be moved in a certain direction and some blades will move on their own, so timing comes into play. As you progress through the game, there will be more and more blades to deal with, which means more fingers and maybe even your nose. Between levels you’ll be treated to sneak peak screenshots from Activision and Radical Entertainment’s upcoming title: PROTOTYPE 2, which launches on April 24, 2012. The sequel to Radical Entertainment’s best-selling open-world action game of 2009, PROTOTYPE 2 takes the unsurpassed carnage of the original PROTOTYPE and continues the experience of becoming the ultimate shape-shifting weapon. As the game’s all-new infected protagonist, Sgt. James Heller, players will cut a bloody swathe through the wastelands of post-viral New York Zero (or more simply…NYZ) with unparalleled locomotion, building up a vast genetic arsenal of deadly, biological weapons and abilities as they hunt, kill and consume their way toward the ultimate goal – to kill…Alex…Mercer! PROTOTYPE 2 will be released on April 24, 2012 on Xbox 360, PlayStation®3 computer entertainment system and Windows PC. The game is currently rated “RP” (Rating Pending) by the ESRB, with an expected “M” (Mature – Content that may be suitable for persons 17 and older) rating. For more information visit https://www.facebook.com/Prototype. 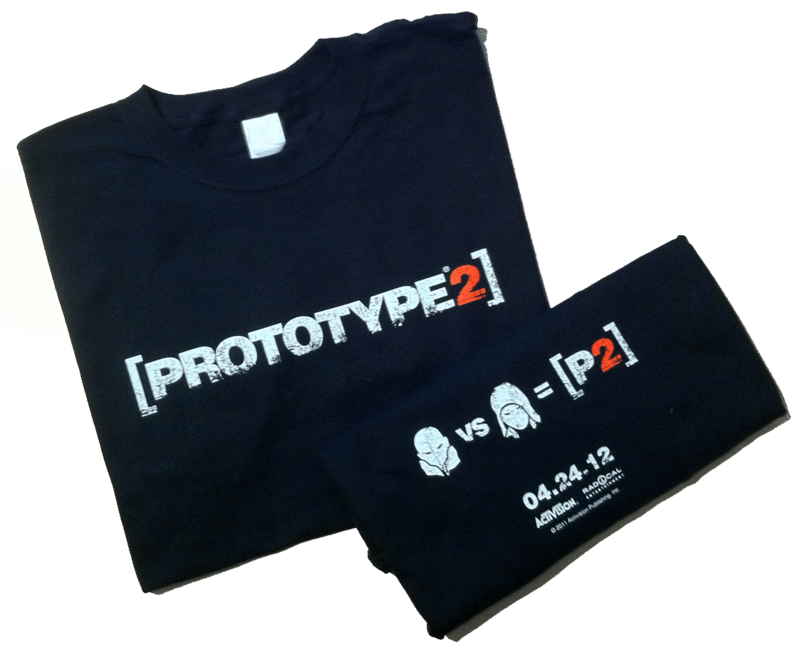 Did we mention we are giving out FREE PROTOTYPE 2 Shirts?! You Have THREE Ways To Enter! Note: Tweeting multiple times WILL NOT increase your chances to win, only your first tweet will count toward the contest, so no need to spam your followers. Leave a comment below, saying why you’d like to win a copy. “Like” the AppAddict.net page on Facebook AND leave a comment on the post for THIS contest letting us know why you’d like to win. Each method above will earn you one entry into the contest for the 5 PROTOTYPE 2 t-shirts. Regardless of method of entry, you are only eligible to win one shirt per person. Don’t worry, your email address is not visible to anyone but us and will only be used to contact you regarding this contest. The giveaway will run until 11:59 PM EST on Tuesday November 08, 2011. Winners are selected at random using random.org. DUE TO INTERNATIONAL SHIPPING COSTS, THIS CONTEST IS OPEN TO US RESIDENTS ONLY.